You can use the tool in this tutorial to test your reboot times; at the link below. Hello NoxX, welcome to Seven Forums! You don't have anything to . ..about; have a look at mine. Sorry - I'm way behind you guys on this one! I would like to try this but after what action are you getting the Window. I know it comes after some updates but is there anything specific? Follow Ted's instructions and you will get there. Not to bad, but how many services and programs did you disable. Ok. You got me. I'm pulling your legs. That was Vista. 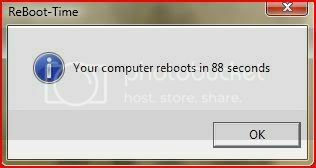 Windows 7 is in 167 seconds. That is with 8 non-essential services disabled on both, icluding the Media centre, which is in that category for me. and any rubbish like Adobe reader and quicktime stripped from MSconfig. I wonder how these guys are claiming faster boot times for 7 - whats the secret?